This article has been updated! It was originally published on October 11, 2013. Everybody probably has this moment at some point. You’re sitting on the couch/hotel bed/locker room bench, watching an international swimming competition on TV. As the first swimmer finishes a race, his or her on-screen clock stops, and then the announcers report that the swimmer has just broken a world record. You marvel for a moment at the feat that would literally have been considered superhuman right up until that moment. Then, slowly, the question seeps into your mind. Like, really. World records are broken every time we have the Olympics. How do people keep breaking these athletic world records? What is it that allows them to transcend the previously known bounds of human physicality, again and again and again? How do the top humans continue to ascend higher with time? To be honest, what seems like the most likely answer comes from a process of simple deduction. For those swimmers, and indeed, for all world-class athletes, who continue to break records, much of the reason for their success is the same reason that we have made contemporary leaps and bounds in communications, medicine, transportation, and finance. What has allowed us to improve in all of those fields? It’s what makes everything about the present, or about the future, different. The variable is technology. Yes, it is posited here that technology has made the difference. And further still, it is posited here that technology will continue to make the difference in human performance in the years to come. Disclaimer: This isn’t to discount those qualities we champion top athletes for, which include hard work, dedication, goal-setting, problem-solving, teamwork, and a host of other things. These things are still cornerstones of true sportsmanship. It can readily admitted that technology cannot do everything for a person; the weight of technology does not yet balance the proverbial brass scale of achievement when it has a fat lead block of “laziness” weighing down the other side. But those values that sports participation instill are not new ones. People have worked their hardest to be the best in their organized sports for nearly three thousand years, and people do the same thing now, harnessing the same kind of grit and self-empowerment. Herein, the information that will be disseminated will be focused primarily on technological developments that will change the game of swimming in the future. The question now is: What hasn’t become popular yet that might change swimming? Will the Olympics become a battle of robots competing for the gold? No, probably not. But (among other things) robots can help us improve our technique in the water. Researchers in Japan created a robot back in 2012 that can reproduce swimming motions at an Olympic level, and then be modified to improve efficiency. It’s called the Swumanoid. Its body is built at a 1:2 scale ratio to the normal human body, so it’s a bit smaller than your average Olympic swimmer, but the findings that stem from in-water applications of work from this robot may do a lot for what we understand about swim training, and even biomechanics. A related robot could also hypothetically be used to benefit and assist the public, in efforts like water rescue missions. It should also be noted that this robot was developed in large part to determine what additional gear would be most beneficial to enhance the performance of a swimmer in the water. Which brings us to another area of swimming technology: the future of gear. When news of tech giant Google’s foray into building digital glasses, Google Glass, first hit the blogosphere, the reactions were polarizing. They were essentially glasses that had a digital screen on the lenses; they were interactive, responding to your voice, and could take photos, videos, and surf the web at your command. Google also kinda told people not to test the glasses in water, for fear of internal component/battery damage (because Samsung recently showed us that failing batteries will land your tech on a no-fly list), but people did it anyway, and it seems that at least this pair was water resistant. Other companies in the post-Google Glass world have also come forward with their own applications of the beauty-is-in-the-eye-of-the-beholder technology, including Sony, Vuzix, and even Snapchat. 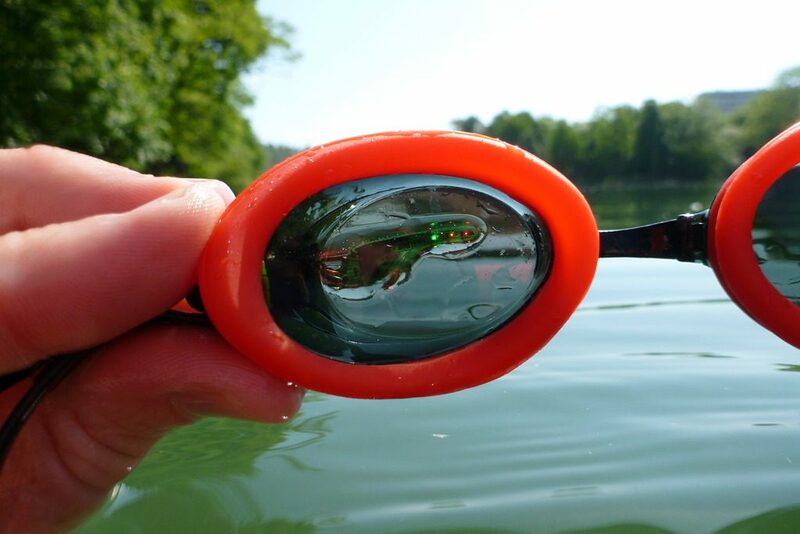 But it seems that there are now also working versions of swim goggles with the same technology! Some older descriptions of future goggle concepts would also see swimmers being able to choose from a variety of visual scenarios, such as coral reefs, dolphin-filled turquoise waters, or wherever else you have dreamed of swimming. That could certainly help you escape the monotony of swimming laps. Aside from being fun, the goggles would also be a huge help in high-level training. As long as there are cameras on the sides and floor of the pool (which many training pools already use), your goggles could show YOU on the screen, swimming in real-time. You could change your stroke and see the results right in front of your eyes, from multiple angles, making for some truly astounding visual swimming coverage, that would help you fine-tune the aspects of your swim down to the millisecond. Hopefully, someone’s taking notes. 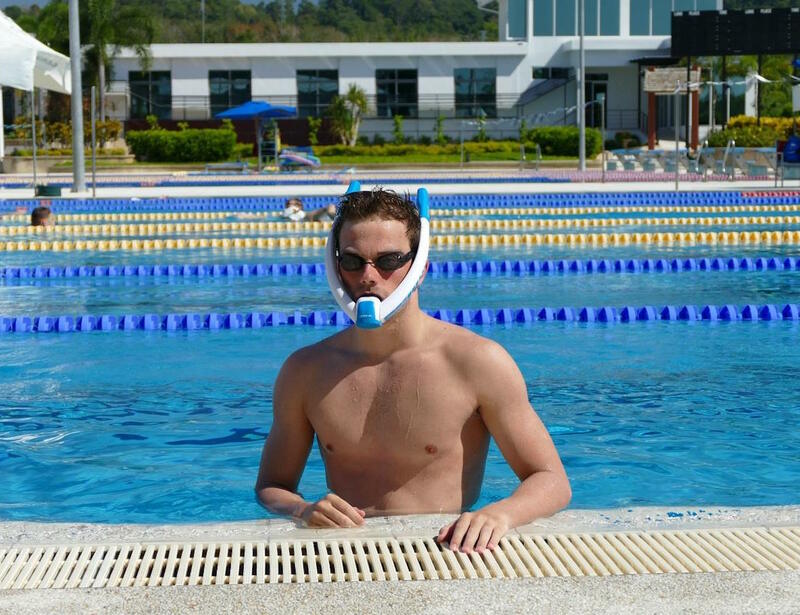 The SEAL, a swim monitor system that implements a collar-style monitor, is meant to improve water safety for both children and professional athletes alike. While drowning is much more common in children, it is a concern for triathletes and open-water swimmers as well. These special SEAL bands monitor the wearer’s journey through the water, sounding the alarm if they have been submerged for too long. There are two sensors monitoring water level and when they are both dunked underwater, they sound a visible, audible, and vibrating alarm. They can also be linked together so a parent wearing one can monitor each child also wearing one. This is especially useful for ponds and oceans, where visibility may be an issue and a blinking light can be the difference between life and death. The cool thing about this product as opposed to others on the market is that it has four adjustable ability levels, so the alarm time can be vastly different for a child versus a triathlete. 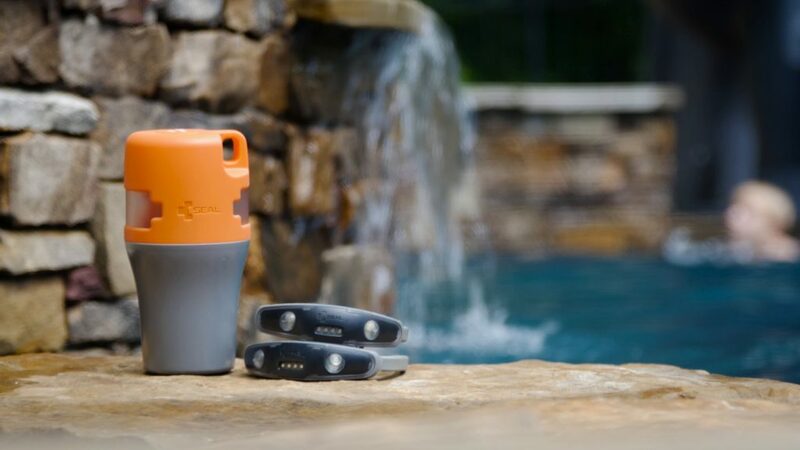 The Powerbreather is essentially a glorified snorkel – except you never have to worry about going too far underwater. With two filters, one on top and one by your mouth, the air is constantly circulated. And with check valves on both filters, it’s impossible for water to enter inside the tube from any direction. Basically, if you’re near the surface you can breathe whenever you want. While this doesn’t seem too useful if you’re training for endurance or to improve your times, it does have other uses. For one thing, it might be a good teaching tool for children or adults who don’t know how to swim and are scared to go underwater. It makes learning to swim much less scary. But it could also be very useful for competitive swimmers. You already have to worry about arms, legs, breathing, buoyancy, body posture, hip motion, and every other little step that is involved in swim technique. When you’re trying to improve and focus on a particular area of your technique, temporarily ignoring lap times and breathing patterns, it might make sense to use the Powerbreather. You can glide through the water at your own pace, not having to disrupt your stroke to breathe. Focus on how your arms are moving. Watch and improve each hand motion without feeling fatigued or pressured. While perhaps not groundbreaking, this could be a useful training tool to improve technique or focus on strength training, and that shaves off those extra digits on the finish times. The sad truth is that as swimming evolves with advances in technology, you will be left behind if you still dress and think like the last person. You probably shouldn’t get rid of your old gear right away… don’t rush out and buy everything that’s been invented in the past 5 years, and while you’re at it, don’t do that for your kids, either. But it’s not a bad idea to keep up with the latest technology in the news so that when something truly groundbreaking comes along, you can get on board. Because of its popularity and health benefits, swimming technology is constantly improving, and you may be surprised at what comes next! Here is a great reference if you’re wondering what people are thinking of inventing next. The focus may shift from public pools to in-home trainers, such as ‘swim pods’, submersion pools, and more.